Adah watches the sunset and thinks about the children who have died in the village. Whenever a child dies, Nathan goes to visit the child’s parents and tries to explain how the parents could have saved the child’s soul by baptizing it. Nathan’s approach to death only increases the pain to the deceased’s family—he uses the tragedy to try and make the parents feel guilty. Without saying so, it’s obvious that Orleanna finds this unconscionable. Adah has been spying on Axelroot, and whenever she listens to his radio, she hears the phrase “good as dead” to describe Patrice Lumumba. She gets the idea that President Eisenhower wants Lumumba dead. Adah is amazed that “Ike”—seemingly a kind, grandfatherly man—is secretly murderous. It’s often surprising for people to learn about the U.S. government’s covert actions during the Cold War, whether in the Congo or in any number of other countries. Partly, this is because most American presidents, like Eisenhower, provide a very different image to the public. Arn, Jackson. "The Poisonwood Bible Book 3, Chapter 43." LitCharts. LitCharts LLC, 29 Jun 2016. Web. 20 Apr 2019. Arn, Jackson. "The Poisonwood Bible Book 3, Chapter 43." LitCharts LLC, June 29, 2016. 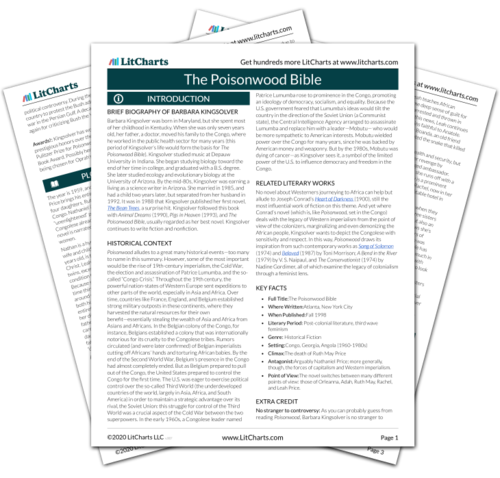 Retrieved April 20, 2019. https://www.litcharts.com/lit/the-poisonwood-bible/book-3-chapter-43.